I've been thinking about slowing things down a bit with my projects. It's hard for me to appreciate what I'm working on or any accomplishment I've made because I keep thinking about what my next project will be. So springing from that thought is a product and company that embodies the enjoyment of the slower things in life. 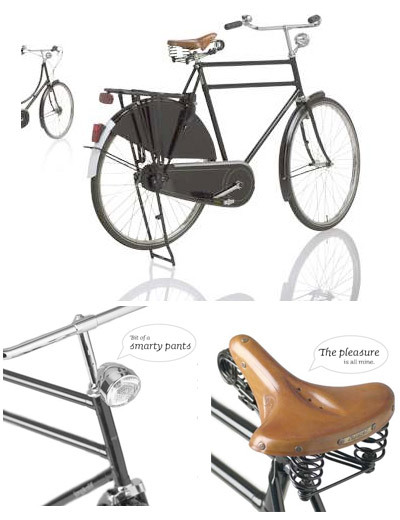 A bike company called Jorg & Olif from Vancouver. And isn't this bike lovely? It's equal parts vehicle and fashion accessory. The design and craftsmanship look impeccable. So Dutch. "We believe that our lifestyles should reflect our values and communicate who we are. The choices we make ultimately shape the way we live, and like most, we are always seeking new ways to make an improvement...After all, it's not about getting from A to B; it's enjoying the in-between." So true. 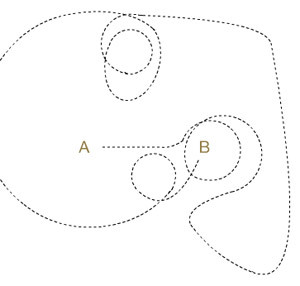 And I love the accompanying graphic. 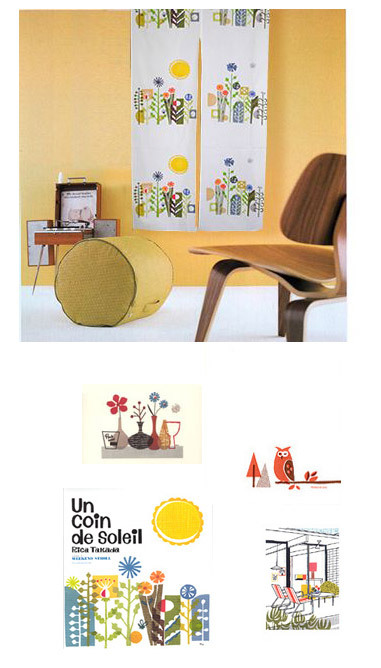 I discovered Rica Takada's whimsical and colorful illustrations via BG Shop (who I picked up from decor8). The colors are very vibrant--it reminds me Ed Emberley's work somehow. Very cute. So we went to the DWR Warehouse sale a week and a half ago all giddy with excitement. They cancelled their Bay Area warehouse sales two years ago but because of popular demand, they brought it back. I went there looking for some chairs, but I didn't see anything I wanted or could afford. I'd say most of goods were still out of my price range, but we did manage to find some deals: $5 FLOR tiles, a $174 icon pendant lamp (reg. 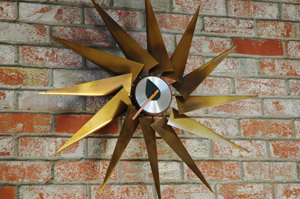 $249), and get this....a $20 Nelson Turbine Clock. Yeah, we were rubbing our eyes in disbelief ourselves. That clock retails for over $400. Luckily, we found this one hidden under one of the tables. There were only 2 clocks priced at $20; ours had only a few scratches and dings, but the other one was missing two brass rays! So would anyone be interested in buying the suspension lamps? We bought them at another DWR sale about 8 mos. ago for $77 each (msrp. $125/ea), but if anyone wants to buy them from me for $45 per lamp, let me know! 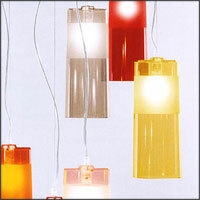 Below is a picture of the suspension lamps from an on-line store. Despite the ubiquity of found paper, I'm still smitten by it. My latest inspiration: Emi Salonen's self-promotional book. What a cool way to showcase your portfolio. It's perfect with varying sizes & styles of paper, the chipboard cover, and the loose thread binding. Too cool. Check out these posters by Iranian designer Reza Abedini. His sense of composition and color is wonderful. 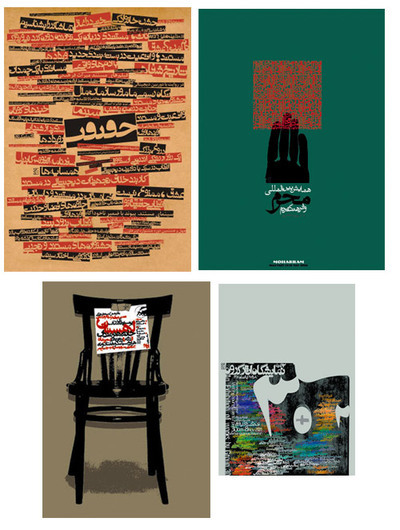 And they have the same spirit as American screenprinted gig posters, just a different language. I actually like it when I can't read the language. I get to appreciate the graphic nature of the letterforms and rely solely on visual communication. Neat. 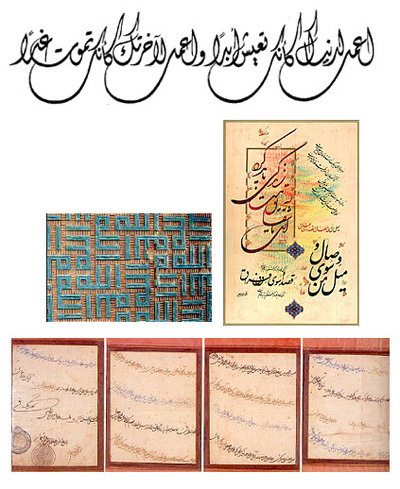 I love calligraphy and handlettering even when I don't understand the language...just look at the different forms of Arabic script. There is a certain thrill you get when you buy thrift store relics: the excitement of owning a piece of nostalgia on the cheap. But as with everything, there is a trade off. Vintage pieces comes in various stages of working order, livability, or cleanliness. Sometimes the time or money it takes to bring some relics up to standard negates any of sort of savings. Still, I accumulate vintage goods...promising to upholster, stain, or sew--like an ersatz remake of a Jacobsen Egg Chair I bought several years ago for $10. Really ersatz: it's covered in some fake leather action and it's a bit poofy. Still for $10, I figured I'd could have it reupholstered and de-poofed. Of course, the chair looks exactly the same as it did on the day we bought it. I'm still determined to make it somewhat more likeable until the day comes that I actually can afford to reupholster it. 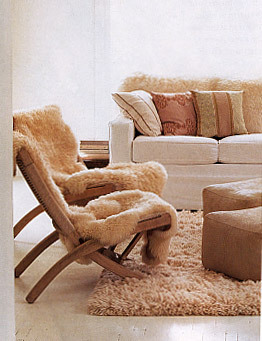 So when I saw this image in Blueprint, I thought that using a sleepskin shearling throw (for $20 at Ikea) would be a great idea for covering up the flaws of a less-than-perfect chair. 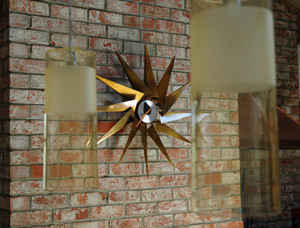 Plus it's a great way to add texture, warmth and intimacy to the room. I'll be making a trip to Ikea this week. Though I cull inspiration from a variety of sources--nothing strikes me quite like street art, graffiti, or urban scenes. There's something about using the city as your canvas. Just see Alexandre Orion's work. He mixes street painting and photography into poignant narratives. 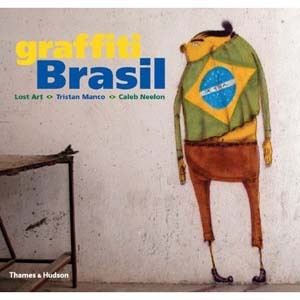 And I think it's such a forward thinking policy that Brazil allows their citizens to create street art on abandoned buildings (provided that it is artistic and colorful). I imagine Sao Paolo must be a visually and graphically charged city. I can only imagine. I just added this book to my wish list, too. So I've been ignoring this blog. On purpose. This is the way I deal with things--the same way I act when I receive a big, unexpected bill in the mail or I have a major deadline to meet. I pretend it doesn't exist for awhile and I just work on other important things like...fold laundry or search ebay. It's probably not a good way to deal with anything. And then at some point I do a 180, pay attention to whatever I've been ignoring....too much attention it. So it goes with this blog (and bills I'm catching up on). I'm probably going post more this week than I have in the last two months.